Become a “Guest” of Dusty’s Place! Your donation will offer hope to those afflicted with scleroderma. 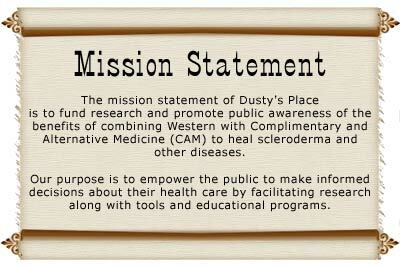 Your tax deductible donation will help Dusty's Place to educate the public about the best of combining Western with Complementary and Alternative Medicine. 100%! of your donation goes to the mission of Dusty’s Place!!! Making a contribution on behalf of a loved one or friend? Please list their name and address and Dusty’s Place will send them a note of acknowledgement on your behalf. If making the donation on behalf of someone else, please list their name and address and Dusty’s Place will send them an acknowledgement note. Please print out this form, fill out and send with your check to: Dusty’s Place, P.O. Box 827 Shingle Springs, Ca. 95682 or call 530 672-2473.